Giovanni Battista Rubini (1794–1854) was an outstanding Italian opera singer (tenor). Being a representative of a vocal style bel canto, Rubini shone onstage during his thirty years career in the theatres of Naples, Rome, Paris, London, Berlin, Saint-Petersburg. Rubini was one of the best performers of primary arias in the operas by G. Rossini, V. Bellini, G. Donizetti. 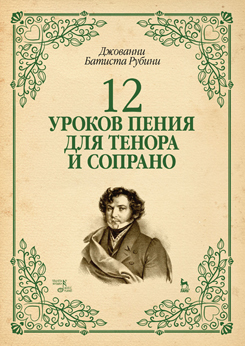 The study guide “12 Lessons in Modern Singing for Tenor or Soprano” was compiled by the singer and was published in 1839. It contains exercises in vocalization on various vocal techniques — cantilena singing, flourishes, roulades, trills, cadencies, recitative. The book is intended for singers, the students of vocal departments of music educational institutions, teachers.